What is Safe Mode in Windows & Advanced startup options ? Windows Safe Mode is a way of booting up your Windows operating system in order to run administrative and diagnostic tasks on your installation. When you boot into Safe Mode the operating system only loads the bare minimum of software that is required for the operating system to work. This mode of operating is designed to let you troubleshoot and run diagnostics on your computer. 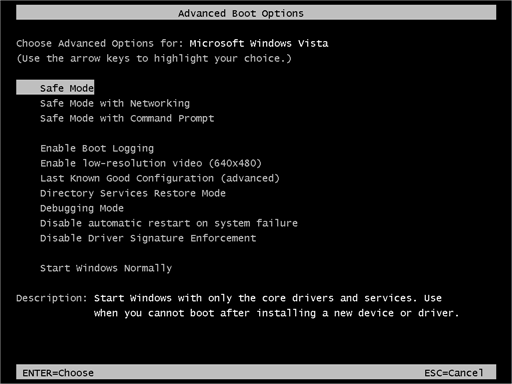 Windows Safe Mode loads a basic video drivers so your programs may look different than normal. F8 - By pressing the F8 key right when Windows starts, usually right after you hear your computer beep when you reboot it, you will be brought to a menu where you can choose to boot into safe mode. If it does not work on the first try, reboot and try again as you have to be quick when you press it. I have found that during boot up right after the computer shows you all the equipment , memory, etc installed on your computer, if you start lightly tapping the F8 key you will usually be able to get to the desired menu. System Configuration Utility - You can use the System Configuration Utility, or MSCONFIG, found in Windows 98, ME, XP, Windows Vista, and Windows 7 to make Windows boot into Safe Mode on the next reboot. We will go into specific details in the sections below. Please note, that you should not force your computer to boot into Safe Mode using the System Configuration Utility if you suspect you are infected with malware as the malware may corrupt keys required to boot into Safe Mode. Different options of ‘Safe Mode’! When you boot your system in ‘Safe Mode’ you will find three different options in the advanced boot menu. Which one you choose completely depends on what task you want to accomplish and which system tools and drivers should be loaded. This is the first and the most basic ‘Safe Mode’ option that doesn’t have any additional support. It is mostly used by the people when they have to resolve issues related to hardware malfunctioning or corrupted drivers. This mode allows you to access the Internet and local network along with the features of the basic mode. It is the most advanced option which allows you to access MS DOS command prompt along with the utilities for the advanced features of system troubleshooting. Only few people know how to use the utilities of this mode and used only to sort out serious problem diagnostics. Remove all CDs, and DVDs from your computer, and then restart your computer. Click the Start button , click the arrow next to the Shut Down button (or the arrow next to the Lock button), and then click Restart. 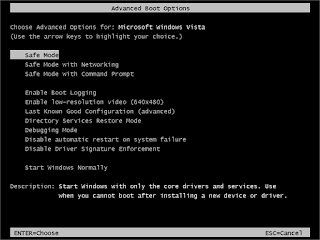 Safe Mode with Networking: Starts Windows in safe mode and includes the network drivers and services needed to access the Internet or other computers on your network. Safe Mode with Command Prompt: Starts Windows in safe mode with a command prompt window instead of the usual Windows interface. This option is intended for IT professionals and administrators. Enable Boot Logging: Creates a file, ntbtlog.txt, that lists all the drivers that are installed during startup and that might be useful for advanced troubleshooting. Enable low-resolution video (640×480): Starts Windows using your current video driver and using low resolution and refresh rate settings. You can use this mode to reset your display settings. For more information, see Change your screen resolution. Last Known Good Configuration (advanced): Starts Windows with the last registry and driver configuration that worked successfully. Directory Services Restore Mode: Starts Windows domain controller running Active Directory so that the directory service can be restored. This option is intended for IT professionals and administrators. Debugging Mode: Starts Windows in an advanced troubleshooting mode intended for IT professionals and system administrators. Disable automatic restart on system failure: Prevents Windows from automatically restarting if an error causes Windows to fail. Choose this option only if Windows is stuck in a loop where Windows fails, attempts to restart, and fails again repeatedly. Disable Driver Signature Enforcement: Allows drivers containing improper signatures to be installed. What if you fail to boot PC in ‘Safe Mode’? At times you may get in to a situation where you fail to boot your PC in a ‘Safe Mode’. It can happen due to several reasons like due to faulty hardware, especially the hard drive that the system is booting from or some corrupt system core drivers. Possibly windows files and boot sectors have gone corrupted. In case you are getting this problem directly after installing any new hardware then it is advised that you take it off immediately. Software corruption can also cause similar issues, in such situation you better try to re-install one the hardware drivers and re-install or repair your Windows OS. The problem can also cause due to relatively advanced malicious program, so in such situations you better try different ‘Safe Mode’ options or try to use emergency boot disk to clean boot and repair your system completely. ||ੴ||ਇੱਕ ਓਅੰਕਾਰ Satnam Shri Waheguru Ji A Web Blog about Product Review, Blogging Tips, Tech Reviews: What is Safe Mode in Windows & Advanced startup options ?